The announcement in this connection was made at a briefing by All India Congress Committee general secretary in-charge for Uttar Pradesh Ghulam Nabi Azad and Uttar Pradesh Congress chief Raj Babbar. Naseemuddin Siddiqui was expelled by Mayawati last year for allegedly carrying out anti-party activities. 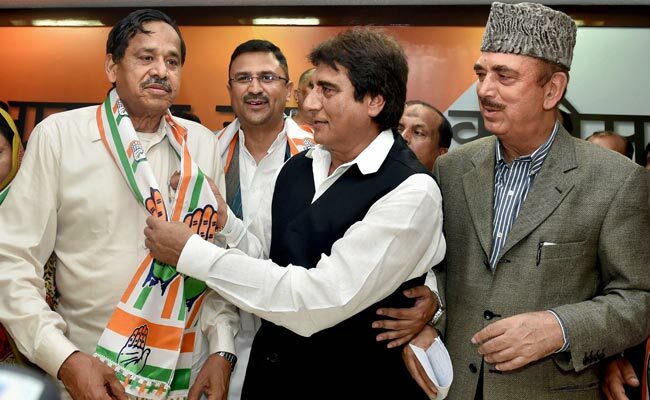 New Delhi: Expelled BSP leader Naseemuddin Siddiqui today formally joined the Congress, and some former Uttar Pradesh ministers. The party said the development implied "changing times" in its favour. Besides Mr Siddiqui, who was considered as the Muslim face of the Mayawati-led party, three former UP ministers, including OP Singh and Liyaqat Ali and ex-MLAs, also joined the party. We welcome these leaders and their supporters. This implies changing times, Mr Azad said at a briefing at the AICC headquarters in New Delhi. Last month, disgruntled BJP MP from Maharashtra Nana Patole had returned to the Congress. Mr Patole had joined the BJP ahead of the 2014 general elections. Meanwhile, several of Mr Siddiqui's supporters had gathered at the AICC head office in large numbers as he entered the UPA major. He also announced that the Rashtriya Bahujan Morcha, he floated after being expelled from the BSP, was merged with the Congress. Mr Siddiqui was expelled on May 10 last year for allegedly carrying out anti-party activities in the wake of its debacle in the Uttar Pradesh Assembly polls.